A dental sealant is a thin, composite coating painted on the chewing surfaces of teeth, usually the permanent molars, to prevent tooth decay. The sealant light cured and bonds quickly into the grooves of the teeth. Because of the likelihood of developing decay in the depressions and grooves of the premolars and molars, children and teenagers are ideal candidates for sealants. Typically, children should get sealants on their permanent molars and premolars as soon as these teeth erupt. In this way, the sealants can protect the teeth through the cavity-prone years of ages 6 to 14. In some cases, dental sealants may also be appropriate for baby teeth, such as when a child’s baby teeth have deep depressions and grooves. Because baby teeth play such an important role in holding the correct spacing for permanent teeth, it’s important to keep these teeth healthy so they are not lost too early. 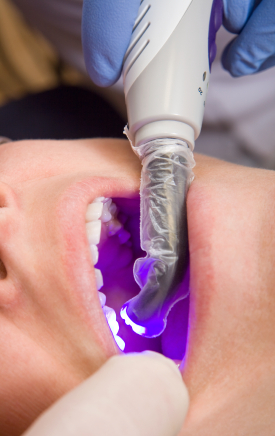 First the teeth that are to be sealed are thoroughly cleaned. A solution is put on the chewing surfaces of the teeth to roughen them up, which helps the sealant bond to the teeth. Sealant is then painted onto the tooth enamel, where it bonds directly to the tooth and hardens. 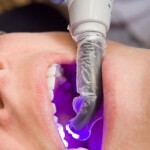 A special curing light is used to help the sealant harden.